Authors are invited to submit their works in good English. Submitted Papers should be sent in doc-format or docx-format. Papers should be as brief as possible and must conform to the following specifications. ① The Regular Articles section is for full-length contributions of original research results. The normal maximum of paper is 6000 words including allowances for figures, references, and tables. The maximum length of contributions is 10 pages. ② The Introduction section is for contributions in which the author reviews previously published work from his own point of view and clarifies the theory and its application. State the objectives of the work and provide an adequate background, avoiding a detailed literature survey or a summary of the results. The length of the introduction should be within 2000 words and should not exceed one page. In the overview section, figures, tables and equations should be avoided. Title　Be as brief, specific, and informative as possible. References, non-standard or uncommon abbreviations and formula should be avoided in title. Authors’ names and affiliations　Names of the author(s) and affiliation(s) where the work was carried out, signature units should be typed in English on the first page of the paper including the name of affiliation, city, postalcode, province, nation. The affiliation should be given to the secondary sector. Abstract　The length of the abstract is at least 200 words and 250 words in maximum. A concise and factual abstract is required. The abstract should state briefly the purpose of the research, the principal results and major conclusions. An abstract is often presented separately from the article, so it must be able to stand alone. For this reason, References should be avoided, but if essential, then cite the author(s) and year(s). Also, non-standard or uncommon abbreviations should be avoided, but if essential they must be defined at their first mention in the abstract itself. Key words　Immediately after the abstract, provide a maximum of 5-7 keywords from the Keywords List at the end of these instructions. Use British spelling and avoid general and plural terms and multiple concepts (avoid, for example, 'and', 'of'). First author’s biography　Biography includes the name, degree, professional title, and Email of the first author. Also, you can offer the information of the corresponding author at the same time, but the information of the first author is necessary. Illustrations and Tables　The content of all illustrations must be submitted in English, and the titles of all the figures and tables must be submitted in English. The figures should be less than 10. The tables should be less than 5. Number tables consecutively in accordance with their appearance in the text. • Make sure you use uniform lettering and sizing of your original figures. Nomenclature and Units　Follow internationally accepted rules and conventions: use the international system of units (SI). Each paper should be consistent within itself as to abbreviations, symbols and units. Acknowledgement　The funds sponsored should be given in the acknowledgement. The number of references should be above 15, and 20 or more is recommended in which books should not exceed 30%. [Serial number] Authors, journal name, Volume (publication year) beginning and end pages. J. van der Geer, J.A.J. Hanraads, R.A. Lupton, J. Sci. Commun. 163 (2000) 51–59. If the page is not continuous in one volume of the journal, the issue should also be given. S. Yamada, H. Itaya, Y. Hara, Iron Steel Eng. 74 (1998) No.8, 64-67. [Serial number] Authors, title，edition，publisher，publication location，publication year. [Serial number] Authors, in Editor of conference proceedings (Eds. ), title of conference proceedings, publisher, publication location, publication year, beginning and end pages. [Serial number] Authors, title, Nation, patent number, publication year. C.J. Won, Method for manufacturing hot rolled galvanized steel sheet at high speed with pickling skipped, US, 6258186B1, 2001. Authors submitting a manuscript do so on the understanding that the work has not been published before, is not being considered for publication elsewhere and has been read and approved by all authors. The submission of the manuscript by the authors means that the authors automatically agree to transfer copyright toJournal of Iron and Steel Research, International when the manuscript is accepted for publication. All accepted manuscripts must be accompanied by a copyright transfer agreement, which should be uploaded to the network and sent to the editor. The work should be original by the authors and not be published elsewhere in any language without the written consent of the publisher. For all articles, authors will be asked to pay a publication fee prior to the article appearing in the journal. However, this fee only needs to be paid after the article has been accepted for publication. The fee is 3000 RMB (for articles within 5 pages) and 600 RMB for each addition page. If the articles do not pass the final plagiarism check before publication, all the fees will not be returned. 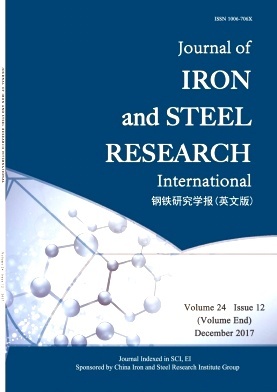 Welcome to pay attention to the service number of Journal of Iron and Steel Research，International in WeChat.